Cooperatives are not ideological cliques trying to detach themselves from the world. In simple terms, they are merely associations of people who establish a business to provide themselves with certain services in order to thrive in the global market. Hart, O. D. & Moore, J. (1998). 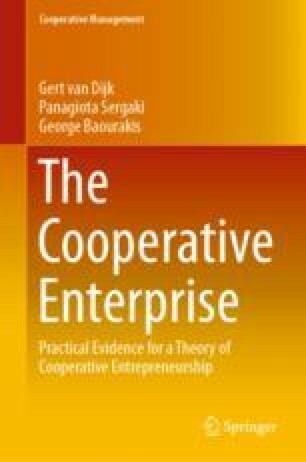 Cooperatives versus outside ownership. National Bureau of Economic Research. http://papers.nber.org/papers/w6421.pdf. Iiro, J., Noreen, B., & Tuominen, H. (2012). Affective commitment in co-operative organizations: What make members want to stay? International Business Research, 5(10), 1–10. Available at www.ccsenet.org/ibr. Kahan, D. M. (2002). The logic of reciprocity: Trust, collective action and law, John M. Olin Center for Studies in Law, Economics and Public Policy. Working Papers. Paper 284 http://digitalcommons.law.yale.edu/leep-papers/281. Michael, P. E., & van Vugt, M. (2014). The evolution of leader-follower reciprocity: The theory of service-for-prestige. Hypothesis and Theory Article. Published on June 2014. https://doi.org/10.3389/fnhum.2014.00363.